Shirts With Random Triangles: Lovie Smith Officially Named New Illinois Head Coach. Lovie Smith Officially Named New Illinois Head Coach. Lovie Smith with Josh Whitman. Image via @IlliniFootball. It looks as thought the rumors about Lovie Smith are true. The University of Illinois has officially named Smith as the school's new head football coach. Smith commented on the hire in a statement released by the University of Illinois on Monday Morning. "I am extremely excited to be named head coach of the Fighting Illini," Smith said. "Josh approached me about this possibility, and I immediately seized on the opportunity to make a difference in the lives of the young men who are part of the program today and in the future. I take this responsibility very seriously and can't wait to get a staff in place to start our move to make Illinois a contender for Big Ten titles. We will play an exciting brand of football that will make our fans, alumni, student body and members of the University community extremely proud." 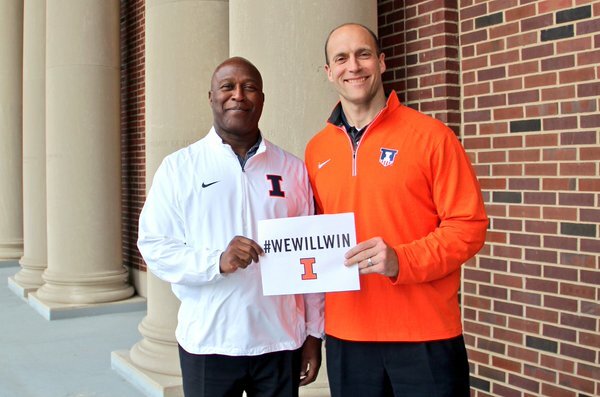 Illinois football also tweeted out some pics of Smith with newly installed athletic director Josh Whitman. Smith was most recently head coach of the Tampa Bay Buccaneerrs from 2014-2015. He was fired in January after accumulating an 8-24 record over two seasons. Before that, Smith was head coach off the Chicago Bears, coaching the team from 2004-2012, and taking it to Super Bowl XXXI in 2007. The Bears lost to the Indianapolis Colts that tear. Smith replaces Bill Cubit, who was fired in a surprise move on Saturday.